Steel toe kick return grill by leading manufacturer Hart & Cooley. Available with the enamel finish white or golden sand. The steel toe kick return grill features a classic vertical slotted design, that also allows for a high effiency of air flow. 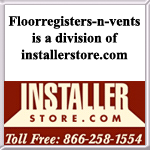 Browse our full line of tranditional and decorative toe kick vents on our Browse by Size page.